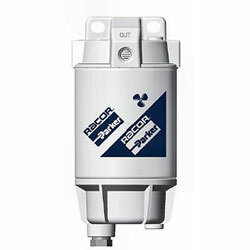 The design of the versatile three-port aluminum head of the 320R-RAC-02 (for inboard, gasoline engine applications, UL listed) directs the incoming fuel flow to the spin-on replaceable element. Aquabloc ® II 10 micron media is used for superior water separation and fuel filtration performance. Water and contaminants are then directed to the bowl where they are drained away through the self-venting drain valve (01 Model) or drain plug (02 Model). Rugged, reusable metal bowl with self-venting drain for outboard applications.